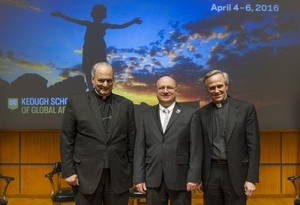 Bishop Marcelo Sánchez Sorondo, chancellor of the Pontifical Academy of Sciences and the Pontifical Academy of Social Sciences, spoke on the keynote panel of the For the Planet and the Poor conference Monday evening (April 4) in the Jordan Auditorium of the University of Notre Dame’s Mendoza College of Business. The conference, organized by Notre Dame’s new Keough School of Global Affairs, has brought together thinkers from the worlds of development policy and practice, government, the Church and other religious bodies to discuss and reflect on the implications of Pope Francis’ encyclical on the environment, Laudato Si’: On Care for Our Common Home and the United Nations’ Sustainable Development Goals, which were approved by world leaders last September. A native of Buenos Aires, Argentina, Bishop Sorondo was ordained a priest in the Buenos Aires archdiocese in 1968 and a bishop in Rome in 2001. From 1976 to 1998 he taught the history of philosophy at the Pontifical Lateran University in Rome before being appointed chancellor by Pope Saint John Paul II. Joining Bishop Sorondo on the keynote panel were R. Scott Appleby, Marilyn Keough Dean of the Keough School of Global Affairs; A. Atiq Rahman, executive director of the Bangladesh Centre for Advanced Studies; Jeffrey D. Sachs, director of the Earth Institute and Quetelet Professor of Sustainable Development at Columbia University; and Sara Sievers, associate dean for policy and practice of the Keough School of Global Affairs.